Having just done a quick search of the internet I can see that the game has already developed something of a following and a lot of people are enjoying fighting skirmishes in the Holy Land which is encouraging to see!!! For those of you who haven’t taken the plunge yet or are considering purchasing the game let’s take a closer look at the rules and hopefully give you a flavour of how the whole thing works. Today we will look at MOVEMENT. Clearly movement is a key feature of warfare throughout the ages and a Commander’s ability to out-manoeuvre his enemy is a vital skill. 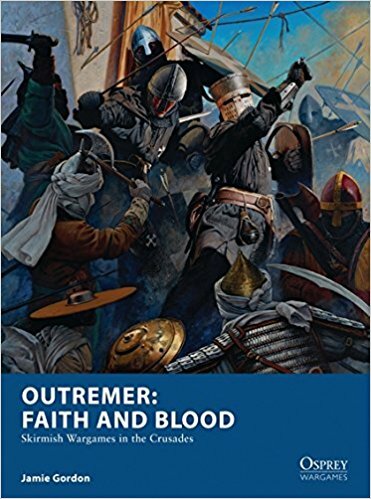 This holds true for players of Outremer: Faith and Blood as much as it does for real life generals. Generally for the cost of one of his two actions each turn a fighter can move as far as the modified movement distance shown in his profile. Modifications are usually exemplified by a reduction in total movement distance when a fighter is encumbered by wearing heavy armour or carrying a particularly unwieldy piece of equipment. If a player decides to use both of a model’s actions for movement then this essentially a double move and is said to represent the warrior running. Now as most of us know the majority of battlefields are rarely flat open terrain and many locations especially in the Holy Land are littered with undulating ground; assorted obstacles and other impediments to free movement. In the game these ground types are represent by Rough, Dangerous and Impassable Terrain each of which restricts or reduces a fighter’s overall movement capability. Of particular note is the fact that trying to traverse Dangerous Terrain can result in a warrior becoming injured... so a Commander needs to carefully weigh up the risks before committing his men to covering such challenging ground. There are also bespoke rules for models attempting to cross fences, water features and other such obstacles which will be made easier or harder depending on what equipment the warrior is carrying. Fighters might well want to move in a vertical as well as horizontal direction and as such there are detailed rules covering how models can climb and descend various terrain features... as well as rules for how an opponent can attempt to shoot them off a wall/rock-face mid-climb. These are further expanded with bespoke rules for situations where models wish to jump across gaps or are caused to inadvertently fall from height. Jerusalem and its outlying areas during the Crusader era were full of buildings of various designs and it’s fair to say many skirmishes would have been fought inside these venues. For those players who wish to engage in this early form of urban warfare I have included four varying sets of rules that are designed to take into account the different types of Wargames terrain available to hobbyists on the modern market. Solid Block: The simplistic option, here buildings are simply treated as giant obstacles with no internal access. Ruins: Damaged buildings that are open to the elements are treated as a sub-type of normal terrain. Internal Mapping: For extra realism and a quasi-RPG feel gamers can create an internal facsimile (either in paper or with bespoke terrain) of the building and transfer the models to this area when they enter the structure. Removeable Roofs: There is some fantastic modern terrain out there with removable roofs and as such I have included dedicated rules so that these can be fully incorporated into skirmishes. So as you can see movement within the game is dealt with in great detail and there is a lot for players to consider before moving their troops around the field of battle. I have tried to make the movement options (and restrictions) as realistic as possible whilst also providing a range of tactical options. It might be considerably quicker for your crossbowman to sprint across that shallow marsh... but can you really afford to risk him losing his final wound... choices and tactics!! question 2: is there a forum for this ruleset? Hello? Are you available to promote your game? I have followed since day one and attempted to fan the flames locally in support of this game but am now thinking that I might need to move on??? Let me know if I am wrong? Hello mate. I certainly am. I’ve been more absent than I would like with my day jobs this year. That being said I am looking at drafting some expansion and new army lists and I know there are a fair few people playing and developing the game. What would you like to see? Also whereabouts are you based? It's not about movement but didn't know where else to put this question. If you take the option to capture a taken down opponent, does your figure also leave the table? I can't imagine any reason to actually kill the opponent rather than capture him unless it comes with the downside of losing a warrior for the rest of the game. If your figure doesn't leave the table, capturing is really overpowered.